Mummi Designs for YOU ~ GIVEAWAY! I've always enjoyed being able to add a personal touch to both the products I use for my children, as well as to gifts that I give. I find that it really just adds more meaning...and shows that you've put thought into the gift. Plus, it's kinda fun to create items that you know will suit your style or the style of a family member or friend! Mummi Quilts is a wonderful Canadian shop that caters to those of us who like to have a say in what the end product we purchase will look like. Not only are you able to choose fabric designs/colors, but you can also personalized some items with a beautiful embroidered name. Jenna received an adorable Personalized Bunny Ear Blankie. It is so cute, and although she's never really been a fan of blankets, she really does love this little security blankie! 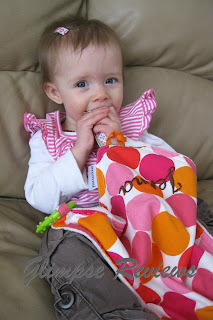 What makes it more lovable is definitely the fact that the blanket is full of special little additions to keep her hands busy (or to chew on! ;) ). There are the soft bunny ears at the top for your little one to play with, as well as a "bunny tail" of several colorful ribbons. The ribbons are probably Jenna's favorite part of the blanket. In addition to that, there's a little toy link attached to each blanket so that you can attach the blanket to a carseat/stroller, or you can also use it to attach an additional toy to the blanket. Each blanket is made with high quality designer fabric, and of course you are able to choose the fabric of your choice for your little bunny ear blanket. These blankets are also personalized with your child's name in beautiful embroidery. We also really like the size of the blanket. 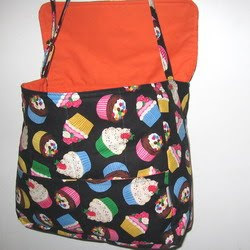 It measures 12" x 12" so it is small enough to easily stuff into your purse or diaper bag. The Personalized Bunny Ear Blanket would make a perfect gift for a new mom or a mom-to-be! We also received a matching personalized pullover bib. I LOVE this bib. Not only is it cute and colorful but it is BIG! It covers Jenna's entire front and does a very good job of keeping her clean (and yes...she is a pretty messy eater! ;) ). Another great feature is that the bib is a pullover - so that means no fussing with ties, snaps, etc. and your little one won't be able to pull it off nearly as easily! These bibs also have the added touch of your child's name embroidered onto them and would also make a great addition to a baby gift or simply to your own kitchen at home. Mummi Quilts creates a variety of other fabulous items in her Mummi Studio right here in Canada! The handmade, personalized baby blankets are one of their main products. Their personalized bags also look very handy. You'll find some other useful accessories too like nursing covers, shopping cart covers and more! Mummi Quilts is giving away a personalized bunny ear blankie to one of our readers. The blanket will be in the winner's choice of fabric and will include embroidery of a personalized name! In order to get one entry, head over to Mummi Quilts and let us know which product caught your eye and what your favorite style of fabric was!